Love Actually.. if only every office had a hunk like Carl! With the nights drawing in and the office newsletter being sprinkled with hints about the upcoming Christmas bash I thought I would bring you some of my favourite Christmas Party styles! I always watch Love Actually in the run up to Christmas and the above is one of my favourite scenes where Sarah realises that Carl *might* just like her back.. *gulp.. cue some hysteria, extreme nerves etc* and I am positive that some of you probably feel the same way about Alan from Accounts, Matt from Marketing or Ian from IT (you get my drift) and I want you to look your foxiest self at your Christmas Party! Every party is very different in terms of dress code and what you will be getting up to so I will aim to cover this in a series of posts throughout November and December. Don't despair if the belle has no work Christmas ball to attend... I will also feature some ideas for Christmas nights out and of course NYE! Make sure you check back next week where the hunt will commence with a post dedicated to hiring the perfect dress! A new concept in couture dressing on a slightly smaller budget, companies such as Girl Meets Dress make wearing the same dress as your fave celeb an ACTUAL possibility. Bandage style dress a la Kardashian? No problem! Red carpet glamour in the style of the A-List? Yup! With new dresses in every week you can pick out what you have dreamed of and strut your way into the party for as little as £30! 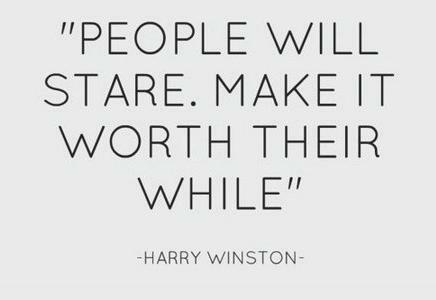 I will leave you with the below statement from jeweller extraordinaire Harry Winston.. this brand knows it's sparkle and THIS should be the Christmas time mantra! Image courtesy of Girl Meets Dress who will be featured in an upcoming post!